Spoiler Alert: If you don’t want to read all of this chatter, there’s a list of helpful hints below. This is my third year of keeping chickens in the suburbs. When we started out, I worried about them being attacked by hawks, foxes and coyotes. Although I live in uber suburbia, this is Colorado and the land our thousands of homes exist on was once a cattle ranch. Continuous development displaces wild animals and they sometimes end up too close for comfort. I realized that. However, several years ago the foxes that had preyed on the local rabbits, cats and the occasional miniature dog were killed and eaten by coyotes. The coyotes eventually left our area because they had depleted their food supply. We relaxed our precautions a little. Three weeks ago I was headed out to visit my extremely sick horse. Fifteen minutes into the drive I got a text from my teenaged son that a coyote had been in the back yard and attacked our free-ranging chickens. My son saw a coyote next to our 6′ fence with one of our chickens, Jenny, in his mouth. The coyote dropped her and jumped the fence, but Jenny was injured. Another chicken was missing. I immediately headed back home. When I got to the back yard, I was able to coax Jenny out of hiding. She had a gash across her back, from wing to wing, exposing bone and fat but without much bleeding. It was a gaping wound, about 1/2″ in width and maybe 3+ inches across. 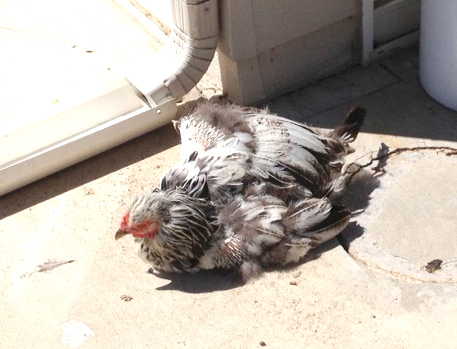 She was missing a lot of feathers, had another 1″ wound under her right wing and a lot of puncture wounds. Her left ear was bloodied and her right eye was closed. But she was alert, responsive and complaining loudly. We put Jenny into one of my portable folding parrot cages and headed east — my horse vet was about 5 minutes away from where I kept my horse and the vet was available for the emergency. He put 5 stitches in her big wound, 2 more in the smaller one under her wing, and sent us off with antibiotics, pain killers and some eye salve for her right eye which was swollen and closed but didn’t have any obvious injury. Back home, I put Jenny into a dog crate in the sunroom, gave her love and medicine and tried to get her to eat or drink. I noticed she was having trouble getting food into her beak, like she couldn’t open it very much. I soaked her pellets in water, gave her her favorite foods (fresh corn, off the cob for now, chopped ham, etc.) in little wet pieces. Her beak looked like it was misaligned, top and bottom, and I thought maybe the coyote broke her jaw when it clamped down on her head. I decided to hold off on the oral meds the next day, thinking I would only hurt her more by forcing her beak open. I kept a close eye on her wounds to make sure they weren’t getting infected since I wasn’t giving her the antibiotics. They started scabbing over the next day. She started opening her right eye after a few days and it was dilated, possibly permanently, and her vision was off. She was still having trouble eating because of her vision problems, but after a few days was able to adjust and now has more luck zero-ing in on food. Her beak realigned and a piece of it fell off three weeks after the attack. I’m thinking her jaw and beak were injured which were making eating painful for her, but the jaw was not broken. She’s doing well now. Tiggy getting some solar therapy. Two days after the attack I was watering some dry spots on our lawn and saw movement out of my peripheral vision. There was a completely bedraggled Tiggy, the missing chicken, picking through the gravel along our west side fence. I have to say that, for the first time in my life, my brain could not interpret what I was seeing. It turns out she had been badly roughed up and hid behind our trash cans for 2+ days — no food or water. I picked her up and put her in the chicken run, and she could not stop drinking. She had been bitten 2-3 times. There were many puncture wounds on her back and tail area and she had huge bald areas from torn out feathers, but her wounds were all scabbed over and not looking infected. Her down had acted as a bonding agent to close the wounds. I borrowed a second dog crate from a neighbor and Jenny and Tiggy spent their nights in the sunroom, for about a week. Jenny and Tiggy have both had amazing recoveries. I have to say I’ve learned a lot from this experience about the body’s innate ability to heal and repair itself. Jenny did just fine without her antibiotics. Tiggy was seriously wounded and yet her body was able to heal itself beautifully with no medical intervention at all. I kept a close eye on both chickens daily to make sure infection was not setting in. 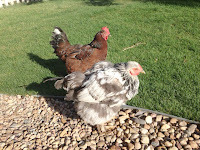 Both chickens rested a lot when they were recovering, continued to eat and were very drawn to stretching out in the sun. Wounds have healed, feathers are growing back, their personalities are returning. A week or so ago I clipped and removed Jenny’s stitches. For the most part, that would have taken care of itself as well: the stitched skin had mended, died off and was sloughing off scabs, dry skin and the stitches as well. I just didn’t want one of the other girls pulling out a stitch the hard way. We’ve built a chicken tractor that we can attach to our chicken run to give the girls more space when we need to go somewhere. We still let them free range when we’re at home, but only if we are within close range and can keep an eye out for them. “Chunnel” connecting the tractor to the run. 1. If the wound is large like Jenny’s was, it will need stitches. Take your chicken to a vet. The vet will clean out the wounds, suture them and send you home with pain killers and antibiotics. It’s not cheap, my vet charged $100, but a portion of that was for medicine. 2. A wounded chicken cannot be left alone with other chickens. They will be attracted to the wound and will cannibalize the injured one. You will need to keep them in separate housing, such as a dog crate. You can let them out for fresh air, sun and exercise if they can handle it, but don’t leave them unsupervised, even around other chickens! I was able to let our two wounded girls out with the flock in the daytime, but kept them in crates at night. Who knows what goes on in a chicken coup all night. 3. Keep a close watch on the wounds to make sure they are not getting infected. Likewise, keep a watch on their demeanor and appetite. If you see changes in either one, there’s something wrong and they need to be seen by a vet. They should be getting better every day, not worse. 4. If your chicken is not eating, you can try adding water to their pellets or feeding them things you know they love. If they are not interested in food a day or so after the injury, something is wrong! Jenny loves corn on the cob but she would not eat it. I realized there might be a problem with her jaw so I cut the kernels off the cob and she devoured them — she just couldn’t poke her beak into a cob to tear them out herself. Scrambled eggs are a great treat, cut up little pieces of meat or fish, macaroni & cheese — I was willing to give her anything to get her appetite going again. Plus the extra protein can’t be bad for a healing body. 5. Vets use dissolving sutures these days, but after 7-10 days, depending on how the wound looks, you can remove them. 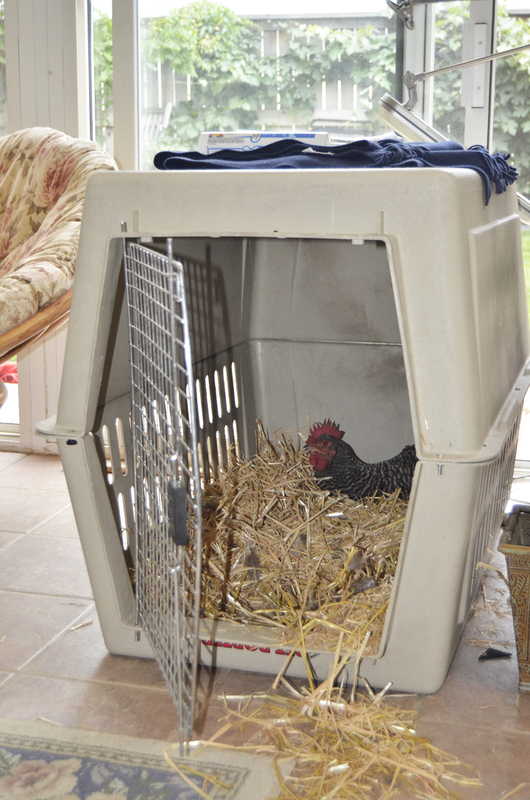 I did this because one of our chickens picks on Jenny and I didn’t want her pulling out one of the stitches! I used a pair of manicure scissors to snip the knots and tugged out the stitches with tweezers. A few were stuck and I just trimmed them as close to her skin as I could and left them to dissolve on their own. 6. Time line: An injured chicken’s wounds should start scabbing over the next day. They may act “out of it” for a day or so, but should gradually get back to eating well and doing the usual chicken things. In a 3-5 days even the larger gaps in the wound will scab over. New swelling, heat and redness around a wound means infection. Some skin patches around the wounds may dry out and harden. This will eventually peel off, while the skin below heals. I trimmed some of this off so the other chickens wouldn’t be tempted to do it themselves. A week after injury the wounds should start looking better and could take 2 weeks or more for the dead skin and scabs to fall off. Feathers could start growing back in 7-10 days. 7. If you keep a chicken separated from the rest of the flock too long, they will treat her like a stranger when she returns and will peck at her. You should keep an eye on them to make sure everyone is getting along. A chicken that does not have all of its feathers is vulnerable–pecking chickens will break her exposed skin, especially if it’s a healing wound. You can also buy or make a chicken saddle to protect her healing back. I made a chicken saddle for Jenny in about 20 minutes and she had no problem wearing it. You can find my instructions and pattern download on Mother Earth News. 8. A breaking beak is apparently not all that uncommon. I found a great blog post on how to repair a broken beak with superglue and a piece of tea bag. I suppose a silk wrap nail repair kit would work as well. This entry was posted in chicken not eating, coyotes and chickens, fixing a broken beak, getting stitches for a chicken, injured chickens, removing stitches, sick chicken, suturing an injured chicken on August 13, 2013 by Farmer Deb. I’m back! At least I hope so. This year so far has been very difficult for me and I haven’t had the time or energy to keep up with my blog. But I’m hoping that’s all behind me now and the rest of the year will settle down. Even though I haven’t been able to write, I’ve been blogging in my head for months. There are so many topics I want to cover! Dealing with coyote attacks on chickens, taking care of seriously injured chickens, the “do chickens feel emotions” debate (spoiler: yes), chicken tractors, chicken saddles, mysterious life-threatening horse illnesses, putting your dog down, my various garden experiments this year with new tomato varieties, my Snip-n-Drip Soaker System from gardeners.com, hoop houses, new recipes, canning foods, getting creative and frugal in the kitchen. I just don’t know where to start! Maybe I’ll just put this up and let it stew for a while. I’ll follow my impulses to what topic to tackle first. This entry was posted in Uncategorized on August 3, 2013 by Farmer Deb.